Over the weekend, I got to spend a good deal of time at Fish Gallery, a high end local fish store. After getting to speak to members of the local aquarium club about aquarium chemistry, I wandered around the store and came across a gorgeous Kessil LED illuminated nano aquarium that was full of interesting and unusual corals. In order to feed my addiction and maybe yours as well, I snapped off several photos of the corals and even a video (article will be published later today). 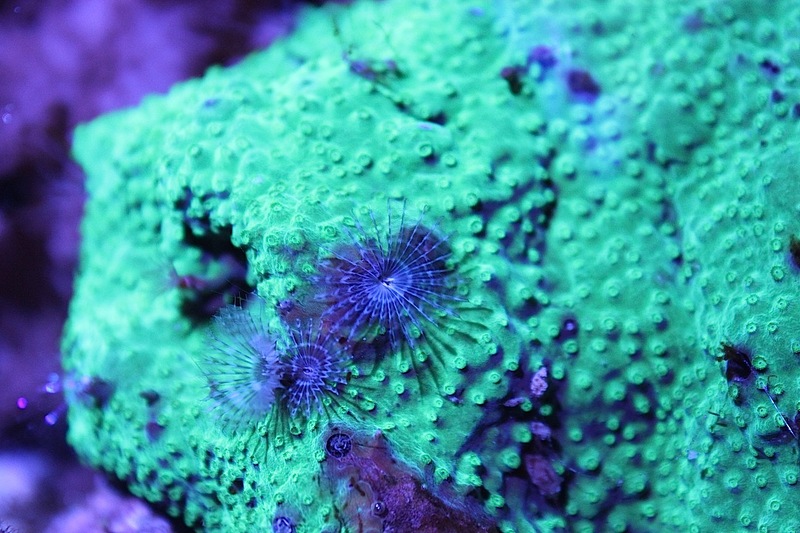 The above photo was by far my favorite, as it shows off a nice cluster of feather dusters that call a glowing green Cyphastrea coral home. In their typical fashion, the feather dusters would dart into their holes almost every time I hovered over the aquarium to get a picture. Fortunately, this little cluster came back out rather quickly, and I was able to get a good shot of them.